Scotland's voters were "treated as an afterthought" in the planning and organisation of the May elections, say experts who reviewed the count fiasco. The results process was besieged by delays and saw some 140,000 ballot papers rejected. Scottish First Minister Alex Salmond and opposition parties blamed UK ministers for the problems. Scottish Secretary Des Browne told BBC Scotland that he was "sorry" if people had been denied their vote. However, he disagreed with parts of the Electoral Commission-sanctioned inquiry, headed by independent expert Ron Gould. Mr Gould said there should be separate election days for Holyrood and local councils and that future elections should consider the voter above all else. Mr Salmond said the findings raised "extremely serious issues" and is to write to Prime Minister Gordon Brown on one of the key recommendations of the report - that talks begin on handing responsibility for both elections to one body, the Scottish Government being the most "logical choice". The Holyrood elections are currently overseen by Westminster, while the Scottish Parliament has control of local authority polls. The elections saw a new ballot paper design brought in and a new voting system for the council seats. 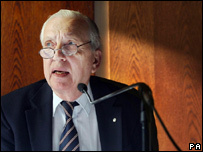 Mr Gould, the former assistant chief electoral officer of Canada, said that in the planning process, the Scotland Office and the then Labour/Liberal Democrat Scottish Government were frequently focused on "partisan political interests". 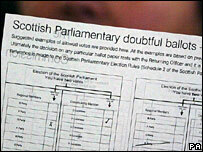 He found strong evidence that combining the Scottish parliamentary ballot papers on one sheet was primarily responsible for the high levels of rejected ballot papers. "Changes were introduced with the expectation that they would simply fall into place," said Mr Gould, who concluded that combined elections were a "disservice" to local government and candidates. "However, there was no effective planning process connecting legislative and operational timescales. "We recommend that those involved in future elections consider voters' interests above all considerations." However, no evidence was found that electronic counting contributed to the number of rejected ballot papers - despite major problems on the night. There was also little evidence, added the report, to indicate that the simultaneous local government election using the Single Transferable Vote contributed substantially to the higher rejection rates in the Scottish parliamentary elections. SNP leader Mr Salmond, whose party became the biggest in Holyrood by a single seat, told BBC Scotland there was a strong argument for holding separate election days. "It's a damning indictment of government ministers, both at Holyrood - the then executive - but to an even greater extent the London ministers," he said of the report. "It's ridiculous that London should have been running a Scottish election in the first place, but having run it and to make a total mess of it is virtually unforgivable." Mr Browne said he did not agree with "every aspect" of Mr Gould's analysis, but accepted a number of the recommendations. They included the "decoupling" of local government and Scottish Parliament elections - an issue on which he said a "positive decision" would be welcomed - and restricting electronic counting to local government elections. Mr Browne added that e-counting would "not be required" for Scottish Parliament polls and said he saw the "advantage" in having separate ballot papers for first past the post and regional constituencies in Holyrood elections. The Scottish Secretary said he had an "open mind" about the recommendation to create a chief returning officer. "It is my principle objective to ensure that in the interest of the voter we will never again face the problems we saw on May 3," Mr Browne told the Commons. "I acknowledge the Scotland Office's role in the overall process and can say now that we have lessons to be learned from the systemic failures that occurred." He later told BBC Radio Scotland: "I really am sorry if people were denied their vote because of decisions that people made and because of any failure of administration." Both the Tories and Liberal Democrats said Mr Browne's predecessor, Douglas Alexander, should issue an apology for the problems. David Mundell, the shadow Scottish Secretary, said: "This is an election that saw more than 146,000 rejected ballots as a result of a catalogue of avoidable errors, failures of oversight and a fragmented approach to the management of the elections." Scottish Liberal Democrat leader Nicol Stephen added: "Organising the Scottish Parliament elections was one of the few significant tasks that the generously resourced Scotland Office has had to do over the last few years and yet the majority of the failures highlighted in this report were its remit." The Electoral Commission welcomed the report and acknowledged that lessons would need to be learned.